Looking for a 100% loan, the VA loan may be your answer. Six updated factors on VA loans rates and requirements during 2018. NSH Mortgage has the knowledge and tools that can help you stay current on the potential savings that VA loans can bring you with its no private mortgage insurance required. Many VA borrowers say that buying a home with no money down is the VA program’s biggest advantage. But there are other characteristics of a VA mortgage that provides huge benefits as well, especially compared to other available financing options. With VA loans, closing costs are often lower, there is less stringent underwriting, and mortgage rates are extremely competitive. VA mortgage rates are typically 0.375 percentage points below conforming mortgage rates and are lower than comparable FHA mortgage rates, too. 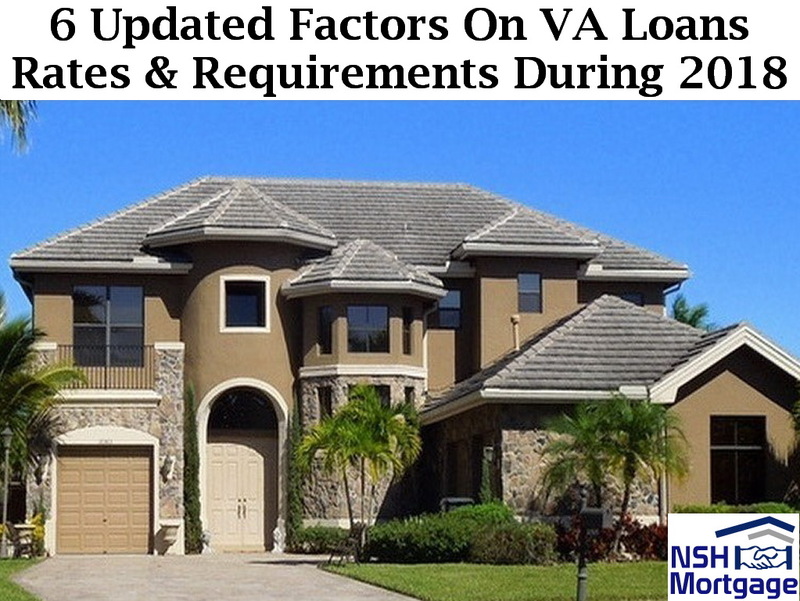 Another big advantage of VA loans that are often overlooked is the absence of a monthly mortgage insurance payment. Mortgage insurance typically comes into play when borrowers have a loan to value of 80% or higher. This form of insurance gives lenders the confidence and flexibility to lend to buyers with less skin in the game. Borrowers can pay the premium and in return are able to put less down. The premiums can be one time charges, paid monthly or both in the instance of FHA and USDA loans. Conventional loans require a minimum 3% down payment. Consumers unable to put down at least 20% will usually have to contend with private mortgage insurance (PMI). PMI rates on conventional loans will vary depending on several factors, like your credit score, your down payment, the loan amount and others. Conventional PMI is typically anywhere from 0.5% to 1% of the loan amount and paid as part of your monthly mortgage payment. For example, on a $200,000 loan, that is anywhere from $1,000 to $2,000 in annual PMI costs. Given that range, you could be adding anywhere from $83 to $167 to your mortgage payment each month. Conventional borrowers typically pay PMI until they establish their loan to value ratio reaches 80%. FHA loans require a minimum 3.5% down payment and the program collects both an upfront mortgage insurance premium as well as an annual premium. The upfront portion is the combination of your loan balance. While the annual fee is typically spread across your monthly mortgage payments. FHA mortgage insurance premiums (FHA MIP) are subject to change. The upfront fee is 1.75% of the loan amount. For FHA borrowers making that minimum down payment, the annual mortgage insurance premium is 0.85%. Using that same $200,000 loan example, the upfront MIP would be $1,700, which ends up being the total loan amount for you. The annual MIP fee adds about $142 to each of your monthly mortgage payments. FHA borrowers can consider refinancing into a conventional mortgage once they have established 10% equity. The USDA Rural Development program is another government loan option offering 100% financing. This unique loan option can be used to purchase or refinance properties in qualified rural areas. Like FHA loans, USDA loans feature both an upfront and an annual mortgage insurance charge. The upfront fee of 1% is added to the loan balance. The annual MIP fee is 0.35%. On a $200,000 loan, the upfront MIP charge would be $2,000. The annual MIP on a USDA loan would add about $58 to your monthly mortgage payment. Qualified VA borrowers in most parts of the country can purchase up to $453,100 without having to factor in down payment. Regardless of the loan amount, one thing they will not have to factor in is mortgage insurance. For a VA buyer looking at a $200,000 purchase price, the benefit of not paying mortgage insurance can bolster buying power. In addition, it is comparable to a FHA loan, which is able to save a buyer as much as $142 per month in extra costs. VA loans do come with an one time funding fee which most borrowers choose to add to their borrowed loan amount. The funding fee cost for most first-time VA buyers is 2.15% of the loan size, which amounts to $4,300 on a $200,000 loan. Borrowers with a service connected disability are exempt from paying the funding fee entirely.